If you’re getting new flooring for your place of business, that’s a big deal. And possibly an expensive deal. We want you to be prepared for the installation. So, here are some things you should know before getting new floors installed. Before removing old floors, find out how big of a job it is. How long is it going to take your reno people? It’s a lot easier and faster to remove old carpeting than it is to remove old tile. Are there repairs to be done to the subfloor? Any leveling needed? Have a good sit-down with your contractor and be clear about how long the work is going to take including the removal of the old flooring. Very likely your business will not be operational while all this is happening. Is your new flooring ADA (Americans with Disabilities Act) compliant? Does your flooring professional even know what that means? There are several rules regarding flooring heights and transitions to accommodate those with disabilities. What’s the order of work to be done? Are you painting the walls before or after putting down new flooring? There are pros and cons to each choice. If you paint before doing the flooring, you won’t (obviously) get paint on the floor, and workmen will not be walking on your new floor. However, there’s a good chance that walls will get damaged while flooring is being installed, and the walls may need touching up afterward. Also, the new flooring could be higher or lower than the previous flooring, and you don’t want to end up with a big stripe of an unpainted wall down close to the floor. If you paint after doing the flooring, everything mentioned above is reversed. 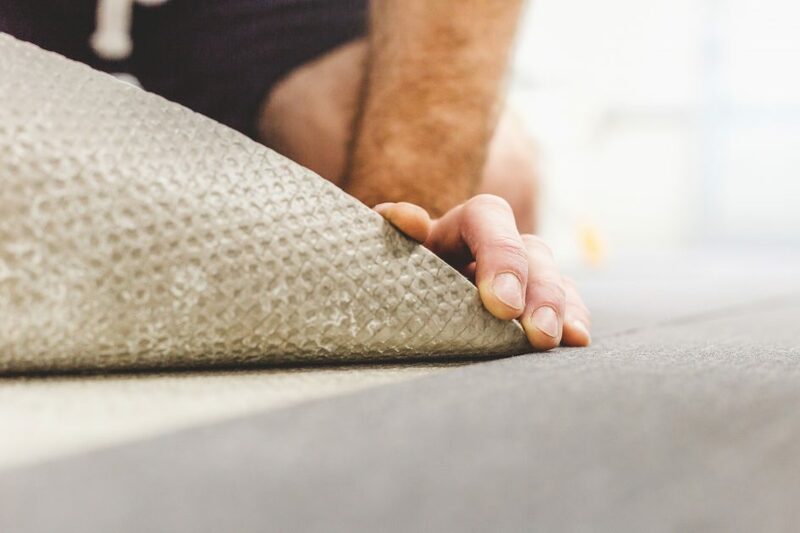 The installation of new flooring isn’t going to coat the new paint job with dust, but there will be construction traffic on your newly laid flooring. Dropped tools can easily crack porcelain or ceramic tiles. Is your foreman going to spill his coffee on your new carpeting? How about plumbing? Electrical? This is something else to discuss with both the contractor and flooring professionals. Make sure everyone understands the workflow and who is responsible for what—and who is insured for what potential problems. What about other areas of your premises that are not getting new flooring. Will there be a problem with flooring heights? Will you have difficulty matching flooring at a later date? Do you want to go ahead and purchase enough flooring to do everything even if it’s not installed all at one time? If your business is in a large office building, you should be in touch with people in client services and in maintenance, so the building is aware of what you’re doing and who is going to be coming in and out. You may need, for example, the total use of one freight elevator for a few hours at a time or the use of a parking space at the loading dock. Make friends with some of those individuals before you need their help in a hurry. Getting new flooring is exciting, and it can significantly change the look and feel of your commercial space. But keep these tips in mind, and be prepared for the disruption to your business. Let us help you to have a quick and seamless installation.